As summer arrives in Iceberg Alley in Newfoundland, Canada, people aboard an Iceberg Watching Tour leaving from St. Anthony, can view an iceberg slowly floating by and see the color variation which really begins to show as the iceberg slowly thaws. 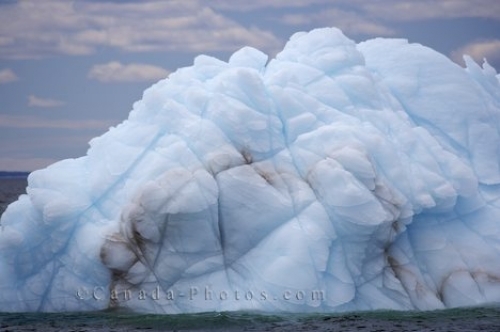 Blue coloring emits from the iceberg with brown patches showing the cracks which are forming as the melting process continues. Picture of the color variation throughout an iceberg seen near the town of St. Anthony in Newfoundland, Canada.